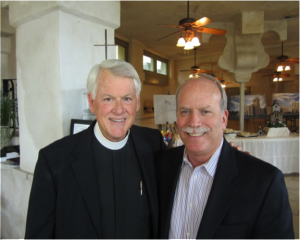 Lago Vista, Texas – Trinity Anglican Church located in the Hill Country just Northwest of Austin, TX celebrated a momentous occasion with a capital campaign kick-off celebration surrounding efforts to build a new church home. Father Dale Chrisman, Rector at Trinity, opened the celebration with a grand welcome followed by prayer before a catered lunch was served to the capacity crowd. The event was held in the ballroom of Villa Antonio where the church family has been worshiping since founding the church. 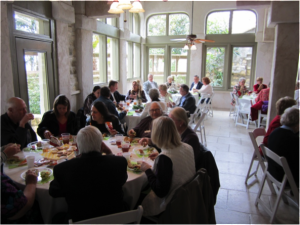 Lunch was followed by music led by Judy Funk and the Trinity choir followed by a rousing pep talk by Trinity’s capital campaign steering committee chairperson, Ed Reid. He spoke about the successful exciting results of the first phase of the campaign. Father Dale then introduced the featured speaker for the event, The Rev. Perry Koon. Rev. Koon delivered a moving story of how a new church welcomed him as a lost 24-year old who had never been to church before and how they introduced him to Jesus Christ changing his life forever more. During the celebration, Father Dale introduced two excited members, Dottie Reid and Stuart Smith, who offered heart-felt spiritual testimonies. Their stories told of their first visit to Trinity Anglican Church, why they returned to become a part of the church family and how excited they were to be vital parts of the capital building campaign efforts. The anxious waiting ended and excitement lifted to a new high when the announcement came that $593,600 had already been pledged toward the goal prior to the Kick-off celebration event. Many members commented to both Father Dale and the campaign consultant, Jim Collins, that they were awed with the amount having never dreamed it could be so high, so quickly. It was only four and half years ago when a group of families first gathered together to worship at the Villa Antonio in Jonestown, TX. Having a dream to serve their church family, community and extended community, their ministry efforts have grown as has their dream of having their own church home. Approximately two years ago, the dream began to manifest into reality as research commenced to find land and contact professionals to aid in development. 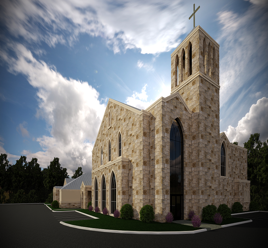 Land was soon purchased and less than a year ago, architects were contacted culminating church efforts into renderings with site plans, interior and exteriors designs. The renderings were unveiled just a week prior to the Kick-off celebration to the amazement of the congregation attending a church-wide focus group meeting. The excitement continued during the celebration event, ending with more music from the choir and a closing prayer offered by Fran Rimmer. The capital campaign duration is five years. Planned efforts call for Trinity Church volunteers to call on every family member to share vital information through personal visitation. This also gives members an opportunity to share their comments and ask questions in the privacy of their own homes. Over a third of Trinity families have already been visited expressing comments ranging from how informative the visit was to enjoying the opportunity to share personal comments, having questions answered and taking part in building a new church building.